RUGBY: CHOBHAM turned up the heat to overpower Twickenham in London 1 South. Under blue skies and temperatures rising, a healthy crowd greeted the teams. Chobham made one change to the starting line-up from the win on the road at Havant – No8 Dave Askew returned to the line-up for the first time since November and Tom Riley, Mike McDonald and Lewis Manning came on to the bench. 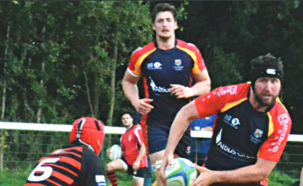 League newcomers Twickenham came into the match full of confidence after their drubbing of Cobham the previous week, and on the back of a long unbeaten record which secured their promotion. The opening encounters were played at pace with Chobham conceding two early penalties and a free kick. Fortunately for the home side, the visitors were unable to take any advantage from the infringements, and on 13 minutes the hosts opened their account. From a tapped free kick, prop Sonny Kuwana led the charge, followed by Ryan Gregory and Angus Hamilton. When the ball reached Ben Sims on the burst he barged his way over to score the try. With 25 minutes gone, Sims came to the home team’s rescue as a sharp Twickenham attack looked threatening. However, two minutes later, Dominic Brown opened the visitors’ account with a well-struck penalty from 40m. With the mercury rising, the pace remained high and the crowd expectant. The next score came from Chobham, and a superb team effort it was. With forwards and backs linking at pace, that man Sims was heavily involved again and a return pass saw him accelerate through a gap to touch down. Dunne converted. With the crowd now looking for Chobham to increase their lead, they were hushed by a shock Twickenham reply. With the home side pressing, Michael Buck gambled as he intercepted a pass and ran 80 yards down field to score. After the break Chobham were a different being. From a well-executed line-out catch and drive, the forwards rumbled and replacement Riley emerged with the ball to claim the score with the second period only six minutes old. Just three minutes later a team try increased the lead, Josh Devitt touching down. Devitt added his second shortly after following a superb break from the back of the scrum by Askew. Livewire scrum-half Ian Barnes, who had been busy all day, nipped over for his first try of the afternoon on 66 minutes. And with four minutes remaining on the clock, a carbon copy of the catch and drive again saw Riley emerge from the pile up with the ball to secure his brace.